For use with 3/8″ lances (Series 51062). Stainless steel. Working pressure up to 10,000 psi (700 bar). 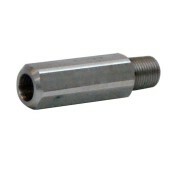 For use with 1/4″ lances (Series 51059). Stainless steel. Working pressure up to 10,000 psi (700 bar). For use with 5/16″ lances (Series 51061). Stainless steel. Working pressure up to 10,000 psi (700 bar).